October is an exciting time for kids – winds howl as classroom chatter turns to preparation for Halloween. “What are you going to be this year?” becomes the most-repeated question, though it’s often met with “It’s a secret!” Halloween is a great time to create lasting memories with your children, especially if you’re willing to get crafty and creative and help your child make a great costume. Many little girls may want to dress up as their favourite Disney princess and boys may likewise wish to personify a Teenage Mutant Ninja Turtle or another superhero, but convincing them to spend some time with you to see what costume creations you can come up with together may be easier than you think. Your child may have their heart set on a store-bought costume; suggest making one together and tell them that if they really don’t like the costume they make themselves you can still go shopping for another one. If that still doesn’t work, it’s time to pull out the big guns: Lenzr‘s fall photo contests provide a lucrative incentive. The Homemade Halloween Costume photo contest is proud to be your secret Halloween weapon this year. When you tell your child you can win $250 in cash (or candy) by making the best homemade costume it may not be long before you see pipe bending and box collecting going on in your living room as your young robot creates his/her new look. Boxes are versatile costume-building tools–you can make refrigerators, ovens, ‘kid-in-the-showers’–tin foil for sci-fi, burlap for zombies or mummies, or real flowers for Mother Nature. A homemade costume will carry with it the pride of its conception and construction, and the fond memories of making said costume with a parent will last indefinitely. You’ll also save money, and might even win money! This contest was sponsored by a boutique marketing agency that specializes in social media contests. The House for Renovation photo contest is another Halloween-themed challenge–this time focusing on that creepiest of buildings, the infamous haunted house. 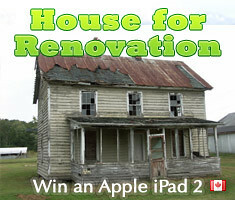 The contest is titled differently, but haunted houses and houses in need of renovation are one and the same to Lenzr. They are not, however, one and the same to kids–kids wouldn’t give a second thought to a deflating porch or leaky roof, but tell them you suspect the place might be haunted and you’ll have instant interest. There are lots of Haunted House hay rides or neighbourhood walks at this time of year, and possibly even a house in need of renovation, I mean…Ghostbusters, on your own block. Try to include a story in your entry (even if it’s just what you and your kids imagine might be inside scaring people away). The prize is an Apple iPad, courtesy of the contest’s sponsor, a Toronto mortgage broker. The Our Daily Bread photo contest leaves behind the chocolate, chips, pop and sugary candy of Halloween for the wholesome and sustaining taste of bread. Bread is an ancient food source vastly superior to the processed sugars that are soon to be the bane of teachers’ existences across North America. Do you ever bake your own bread at home? Breadmaking is not as difficult as it’s made out to be, and is certainly yet another way to connect with your children, while at the same time teaching them of the importance of making healthy, delicious food, and demonstrating their creative skills by taking a photograph that looks appetizing. The prize is a breadmaker courtesy of the contest’s sponsor, a Natural Artisan Bakery that sells all its organic ingredients online. The Warehouse Stockpiles photo contest is the most challenging contest of the lot, but rewards the best photograph with a great prize. This contest is looking for submissions that depict inventory management and this could include car parts, food supplies and even children’s toys. This could be a great learning exercise for kids; young kids don’t think about things like manufacturing or distribution or production planning, often times they think that the store is where the process begins. If you are able to find a warehouse for you and your child to photograph, it will open their eyes to all the tremendous work that goes into bringing products to the public. The prize is $250 and a photo licensing agreement with the contest’s sponsor, a manufacturing software making that is looking for warehouse-related photos for its website.